Targets above 150 were never chased down even in T10 cricket, but Brisbane Heat managed to gun down a 157-run total exactly in 60 balls, thanks to a herculean effort from Max Bryant and Ben Cutting. With this win, they are again back in the hunt for a place in top four, but since all their games are done, all they can do is pray. 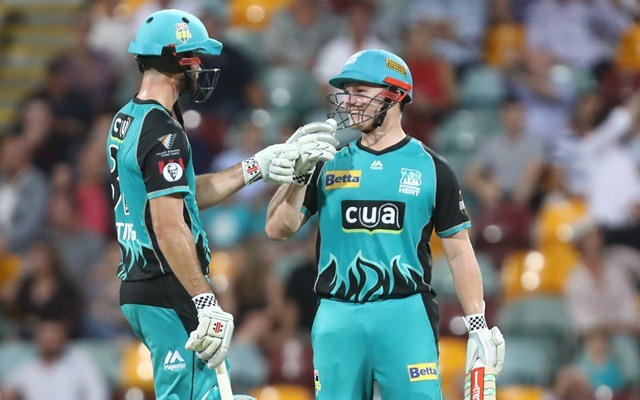 The Heat had everything at stake against Melbourne Stars on Friday and with Marcus Stoinis shining with the bat, Stars registered 156 runs batting first. Apart from all-rounder’s 51-ball 81, there were no major contributions from the rest. Josh Lalor picked up three wickets for the hosts. It was a carnival pandemonium at The Gabba in the next 10 overs of cricket, as Ben Cutting and Max Bryant just out-muscled Stars’ bowlers with brute power and stellar execution. They hit 13 sixes between themselves, with Bryant scoring 71 off 30 balls and Cutting ending up with 81 of 30 balls. It was a handsome 10-wicket win for Heat, which keeps them at the fourth spot temporarily. The duo amassed runs at a run rate of 15.8, which is the highest run rate registered by any team in T20 cricket history (Minimum 50 balls). They ousted Saudi Arabia’s record of 14.94 set against Kuwait, which incidentally was registered just a few days ago (On January 24th). Other notable names include New Zealand, who scored 147 runs in 10 overs against Sri Lanka in 2016. In that game, Colin Munro registered the second fastest fifty in T20I cricket and was backed well by a brilliant fifty from Martin Guptill. Guyana Amazon Warriors’ amazing win against Jamaica Tallawahs back in 2017 too makes it to the list. Royal Challengers Bangalore scored 211 in 15 overs against Kings XI Punjab in 2016 in a rain-marred game. That effort from Virat Kohli‘s troops gained the 8th spot in the list. It took a monumental effort from the Dutch in 2016 to defeat Ireland and earn a spot in the Super 10 stages of World T20 as they chased 193 in less than 14 overs.